For instructions on how to add an Attendance activity to your course, view Moodle 3: Activities & Resources: Add Attendance. In the General settings, you can change the default name of the Attendance activity. If the instructor does NOT want the Attendace in the gradebook, change the Type to "None." Otherwise, keep it as a Point and edit the Maximum grade. The grade category can also be selected here. 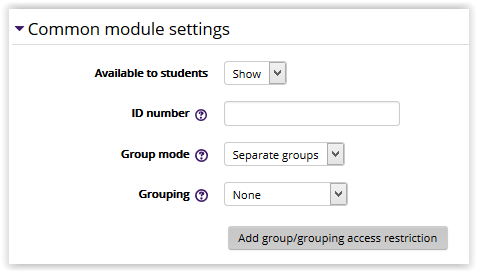 These settings specify the visibility of the Attendance activity for students (Hide/Show), and the group mode and grouping can be designated. Attendance can be restricted based upon a date, group, activity completion of another activity/resource in the course, etc. By default, students can manually mark the assignment as complete, but an instructor can change this to be required. If required, the students can be marked complete by viewing the acitivy, receiving a grade, and/or submitting the assignment.